“Who needs a man?” Phoebe asks in one image, wearing zebra heels and a pencil skirt. “Are you in charge of your love life?” she asks in another. 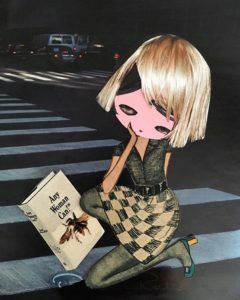 In runway images she appears with exclamations like, “It’s MY style.” Her artwork often raises a playful eyebrow at the fashion industry while questioning beauty standards and feelings about love and gender.